After reading Wei Ling Chua’s second book, Tiananmen Square “Massacre”? and its startling revelations of a western disinformation against the Chinese government, I was eager to read his first book, Democracy: What the West Can Learn from China. His analysis is thought provoking and at stark odds with the preponderent western mass media narrative. Chua seeks to compare and contrast the effectiveness of political systems in a scientific way. Since the well-being of the citizenry is undoubtedly the raison d’être of a government, Chua attempts to gauge government responsiveness to the needs of the people during a disaster. He examines the Australian government aid to victims of bushfire, American government response to victims of Hurricane Katrina, and the Chinese government response to victims of the 2008 Sichuan earthquake. Many capitalists are reaping the windfall of China’s low-wage workforce and huge market. However, the success of a socialist China poses an existential threat to capitalism. While critics of China deride its economic system as capitalism by another name — socialism with Chinese characteristics –, this is too simplistic. For example, much of the control of the economy still resides in state hands5 while in the West ongoing privatization concentrates wealth into fewer and fewer hands. 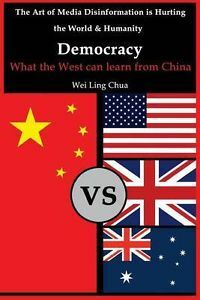 Democracy: What the West Can Learn from China causes open-minded people to sit back and consider the supposed superiority of the western multi-party political system6 vis–à–vis the one-party system in China. The book details a political system wherein people do not vote nationally for their government members, and yet, by way of comparison, the CPC is, arguably, more responsive and attuned to the needs of the citizenry than are the representatives elected in the West. • Part 2 is an interview with author Wei Ling Chua in which he discusses his books. This article was posted on Tuesday, July 1st, 2014 at 7:26am and is filed under Book Review, Capitalism, Censorship, China, Communism/Marxism/Maoism, Corruption, Democracy, Disinformation, Media, Privatization.